Dave always said I would be the best wife if I could make his Mum's chocolate slice yep that slice is the best in history! So I decided to finally give it a crack! The funny thing is they all love it when it's in the freezer and stays there haha! Preheat oven to 180 degrees and line slice tin with baking paper. Add all dry ingredients in the bowl melt the butter and pour into the bowl. Beat the egg and add in, mix all ingredients until combined, pour into prepared slice tin. 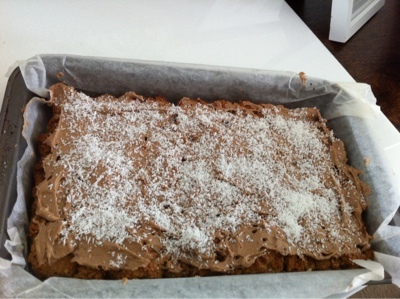 Bake for 20mins, add all icing ingredients and stir and ice the slice when cool, sprinkle coconut over icing.